Update: 2/18/16: At this point, 18 months after I've taken Elite Blog Academy, I'm now earning a full-time income and I have Elite Blog Academy to thank for that! 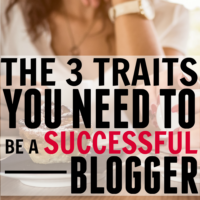 If you struggle with trying to figure out how to make blogging work for you, then this post if for you. I've been where you are and in the last year that I've blogged, I increased my pageviews to 320,000 per month and made enough to make blogging my “full time” job (but I only have to work 20 hours a week). It wasn't easy, but there's one single thing that I credit with every part of my success… a blogging class. I'm going to walk you through what a blogging class is, what makes a “good one”, what to expect and how to afford it. Then, I'll give you an AMAZING deal on the blogging class that launched my success, The Elite Blog Academy. A Blogging Class is a course that teaches you step by step how to blog for a living. It can also be referred to as a class to “monetize your blog”. A good class should take you through each step and ensure that you understand everything you need to know to make a full time income from blogging. The essential things to cover would be creating content, Pinterest, social media, graphic design, SEO, monetizing, ad networks, working with brands, affiliate strategy and blogging as a business. A good class needs to share the resources that you need to succeed and give you clear direction. A Blogging Class can be the catalyst that you need to take a “hobby” blog to a full-time income quickly and (mostly) painlessly. I blogged for 2 years as a hobby, never realizing that people made a full time living off of a blog. I had no idea. When I found out, It blew my mind. I knew I wanted to try to do that and got completely bogged down in things that were way over my head. I didn't understand the technology, and nothing seemed to make sense to me. 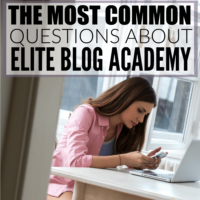 I saw one of my favorite bloggers, Ruth Soukup, offering The Elite Blog Academy. The course promised to guide me through how to blog for a living. I sat my husband down with this huge ridiculous speech about how I wanted to spend money on a blogging class (at a time when we were saving every penny we had to help see us through my husbands new business venture). The number one thing that I credit my success to, is the Elite Blog Academy, the blogging class that I took. There is no way that I would be where I am today without that. It wasn't just me though. Through the friends I've made in that class, I've been able to watch my classmates increase their income, stay home with their kids and meet their goals. While I'm certainly a success story, one of my classmates makes over $10,000 a month on her blog! 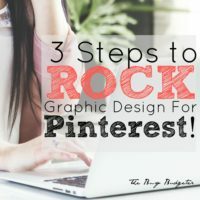 Pinterest is a game changer when it comes to blogging for an income. Because Pinterest consists almost entirely of blog posts, this is the number one thing you can conquer to grow quickly. You need someone to guide you, show you how to use group boards in your favor, when to pin, what to pin, and how much to pin. You want to understand what makes a pin perform well and create a marketing plan for Pinterest that will bring you tons of new traffic. (Seriously! I went from 60,000 pageviews to 320,000 pageviews in 11 months!) A good blogging class will show you how to utilize Pinterest to explode your traffic and income. You can have all the pageviews in the world, but until you understand how to monetize your blog, you'll never make an income from it. You don't need to be sleazy or dishonest to make a living from a blog and you don't have to monetize in any way that makes you uncomfortable. In fact, I monetize by doing sponsored posts from brands that I love and would have talked about anyway (Shhhh… don't tell them that! ), ads and affiliate sales on programs that I use and love. You need to know how to use your email list effectively, how to work with brands, what to charge, how to create a media kit, and how to write a pitch letter that gets a “Yes”. You have to know what ad networks are worth your time, and what affiliates are worth pursuing. A good blogging class will lay this out in a way you can understand and be very transparent with the relationship between income and pageviews and what to expect as you grow. You need to have people you can ask questions of. Whether it be a tech issue that you don't understand, advice on how to handle a sponsored post, or feedback on how others' ad networks are performing for them, blogging is so much easier when you have people around you for support. 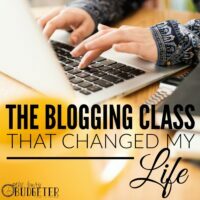 The Elite Blog Academy had me find a mastermind group, and through them, I've been so blessed to find a small group of bloggers that feel like best friends. Just having people to help me through problems or rough spots, suggest new ideas and gently hold me accountable to achieve the goals I set for myself is one of the best things to happen with this blog. A great blogging class will have a Facebook group or a forum of other classmates. This is invaluable for you, because everyone in that group has spent a pretty significant amount of money to be there, so when you ask a question, you're getting responses from people that are dedicated to blogging and many are doing it professionally. This was the hardest concept for me to understand and it covers almost everything. You need to know how to get organized and how to transform your blog into something that helps readers while making an income for you. You need to be able to track statistics, learn how to “A/B test”, get a working (and easy!) editorial calendar, and work smarter not harder. You need to know how (and when) to expand and hire help, and how to start creating products to sell. How do you know if it's worth it? I would recommend a blogging class to almost everyone. The chances that you won't make that money back from your blog are incredibly slim in my opinion. The Elite Blog Academy even has a 100% money-back guarantee. However, there are a few people that should wait on this (just until your situation changes). If you don't have at least 10 hours a week to dedicate to your blog, I would wait to get a blogging class. You need to do the work in order to see the results. This is pretty time intensive. 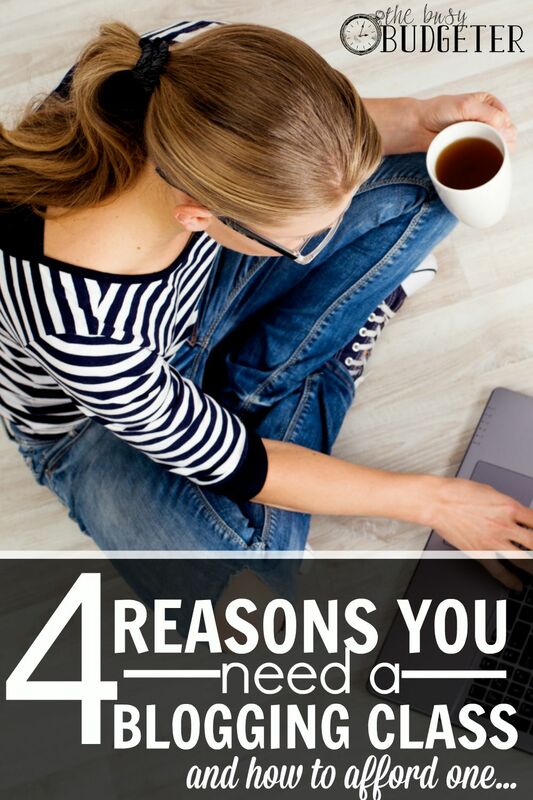 10 Hours a week can be 2 hours every weekday while your husband watches TV, or 1 hour of eating lunch at your desk and blogging during the weekdays and an extra 5 hours on the weekend. If you're the type of person to quit easily, wait on this. This isn't a “get rich quick scheme”. This is, “blog for hours, days, weeks and months for free (or close to free) and one day you can make thousands a month”. I honestly believe that you can have the same results if you take this class seriously, you do the work and don't skip lessons, but if you're the type to get frustrated and quit, you'll just waste $299, because you'll never get past the “work for free” part. If you hate writing, you should probably not be a blogger. This is kind of a given, but I thought I should mention it. In order to seriously make money blogging, you need to be self hosted on WordPress or willing to become self hosted (this is as cheap as $3.95/month through Bluehost, which I used and love). How do I afford the class? Get your spouse on board. This is a pretty big chunk of change coming out of the household budget, and he needs to know that you're dedicated to this and that you are going to put 110% into this to make it work. Tell him that this is your dream, that you think you can make this work, and that you're going to give it 110% for a year. Then tell him that you'll forgo Mothers Day, Christmas, and Birthday Presents for the year if necessary! Have you made money on your blog at all? Consider this an investment on that income. If you've made more than $300 on your blog, consider this a great way to reinvest that income in order to expand. I don't think there's anything that can give you a greater return on your income. I'm a budgeter- If all else fails, I would shave money off of the grocery budget for two months… a few nights of $5 Dinner Mom homemade mac and cheese or Santa Fe rice and bean casserole (neither is a sacrifice, trust me), and saying no to discretionary spending for a month should give you plenty. The only way you will get a return on this money though is if you apply yourself. Do the work. Every single assignment. Put in your 10 hours a week and make it happen. The blogging class that I took and highly recommend, The Elite Blog Academy, is open to the public for only five days! On February 22nd through 26th 2016. The bad news is that they only open the doors to the class at certain times. They aren't planning to have another class until next year. I took this in September of 2014 and am currently making over $9,300 a month from my blog. I attribute that solely to the Elite Blog Academy. I had tons of ideas and things to write about, but I had no idea how to blog as a business. Ruth Soukup (the Blogger behind EBA), taught me everything I know and it's served me really well. I want you to take this class, apply yourself and be wildly successful. To help you do that, I'm including “The Ultimate Brand Cheat Sheet” for FREE with your purchase of the Elite Blog Academy. My personal formula for finding the brands that say “Yes”! The formula I use to determine how much to charge for sponsored posts. A template for my pitch emails (to send to brands when you want to work with them). A template for my media kit, which you can edit to add your own logo and information then save as a PDF to send to brands. Access to Full-Time Bloggers 24/7! Lastly, I'm sending you the blogging schedule that I used to grow to my blog so quickly with only 10 hours a week to work on blogging! Just follow that schedule and adjust the days to your day off to keep yourself on task. Just forward your welcome letter to me at Busybudgeter@gmail.com to grab the bonuses! You can sign up for the waiting list for The Elite Blog Academy here so you don't miss the sale when it starts on February 22nd! This is your dream. The only one standing in the way of that dream is you. Work hard, make sacrifices and make it happen. What frustrates you the most about blogging? Is this course worth doing if I don’t even have a blog yet? Should I get going with it first and sign up next year? Or would it benefit me to start with the course content in mind? Great post, thanks. I have a similar question as Helena. I DO have a blog…but over the last couple years I’ve posted VERY sporadically and I’m not really a niche blogger– I tend to be more of a lifestyle blogger. I love blogging and writing, but I literally have no idea how to get it out there (and since it’s not a niche blog, I doubt a ton of people care about my family life :)). Would the course be worth it for that type of blog? I have zero reservations about putting in the effort if it will be worth it in a year from now, but I worry about the logistics of that happening. Help! I can certainly understand your dilemma Jennifer. In any business, you have to decide what your target market is and why those people need your product. With blogging, that product may be personal financial advice, humorous anecdotes about family life, or even parenting tips. Your articles will need to provide that product, even if that product is just a laugh or two to brighten someone’s day! Ultimately, you will have to decide whether or not you think people will come to your blog enough to justify the expense of the course. However, over the lifetime of a blog, you are bound to at least be able to reimburse the expense. The Elite Blog Academy is the course I recommend for any blogger, as it is comprehensive, inexpensive, and has a money back guarantee! Good luck with your writing! Thanks for the article. I’ve taken Ruth’s free three-video series and have found it interesting. I’m curious to know how long you were blogging before you took the class? I’m finishing up month #4 so don’t know if I should get a few more months under my belt or take the plunge as a newbie. Visiting from LiveLaughRowe.com party.